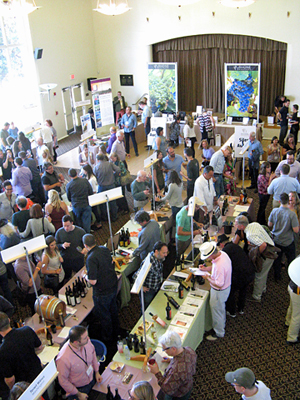 Report on the 19th Annual San Francisco Bay Area Celebration of American Rhône Wines presented by the Rhone Rangers, on Friday and Saturday, June 10-11, 2016, and held at the Golden Gate Club in the Presidio of San Francisco, California. 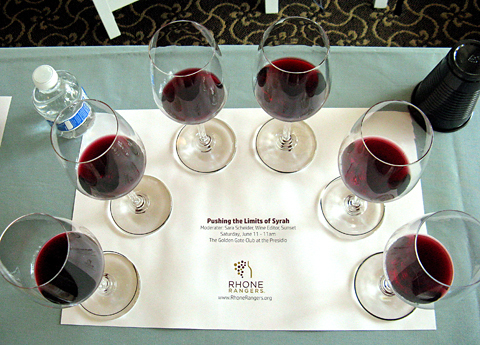 The event focuses on current releases of Rhône-varietal wines from member wineries in the United States. 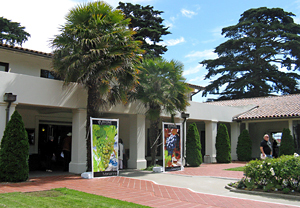 This year’s event started on Friday evening with a walk-around tasting reception, winemaker dinner catered by Sonoma’s the girl & the fig, and live auction at the Golden Gate Club in the San Francisco Presidio. At the dinner, Bill Easton of Terre Rouge Wines was presented with the Rhone Rangers Lifetime Achievement Award, a well-deserved honor. 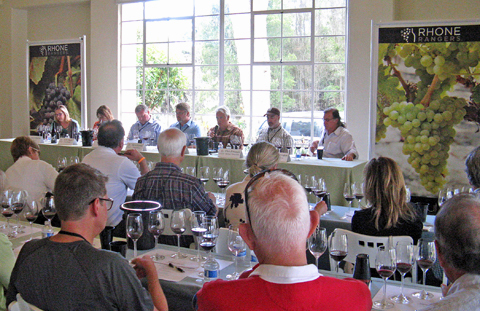 Saturday featured a seminar followed by the Grand Tasting and silent auction in the afternoon. Both auctions benefited the Rhone Rangers Mission and its Scholarship Fund. I attended the Saturday morning seminar and the afternoon Grand Tasting – the tasting impressions below are from those parts of the overall event. The Rhone Rangers organization is a non-profit group, which promotes the enjoyment of Rhône-varietal wines produced in the United States. 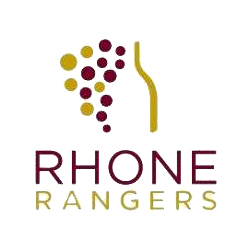 Although the term "Rhone Rangers" has been used since the 1980s to describe some of the early proponents of Rhône-style wines in the US, the organization itself was not founded until 1997. There are now around 150 wineries from California, Washington, Oregon, Arizona, Michigan, New York, and Virginia that are members of the Rhone Rangers. In addition to the San Francisco Bay Area event, there is a Rhone Rangers event held in Los Angeles as well as various regional chapter events. I attended a Saturday morning seminar this year in addition to the Grand Tasting that immediately followed it. This year was a bit of a departure, with a single seminar rather than two, though it was almost like two separate ones since the wines were presented in two flights with two different winemaker panels. Sunset Magazine wine editor Sara Schneider moderated the seminar, which was entitled “Pushing the Limits of Syrah.” Notes on all of the wines presented at the seminar are included in the Tasting Impressions section below. 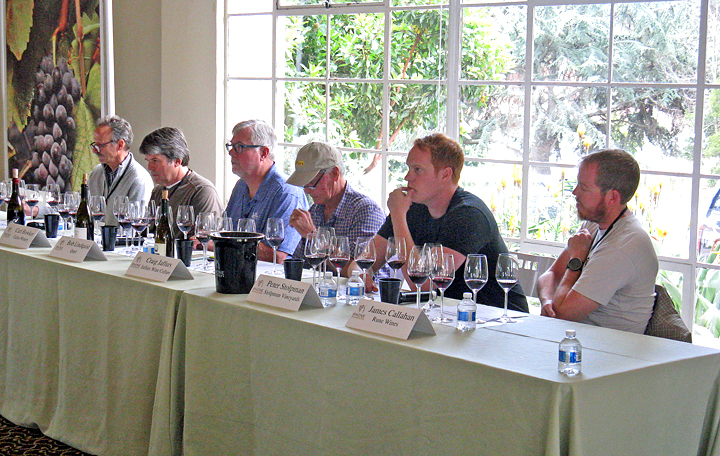 The winemaker panel for the first flight of wines consisted of K.D. Organ of Tenet Wines, Ben Crane of Westwood Estate, Steve Gower of Crux Winery, Bill Easton of Terre Rouge Wines, Chris Pittenger of Skinner Vineyards, and Randall Grahm of Bonny Doon Vineyard. The second panel featured Christopher Whaley of Wrath Wines, Carl Bowker of Caliza Winery, Bob Lindquist of Qupé, Craig Jaffurs of Jaffurs Wine Cellars, Peter Stolpman of Stolpman Vineyards, and James Callahan of Rune Wines. The Syrahs were presented in order from north to south (from Washington for Tenet to Arizona for Rune) – something that was not explained and that I only picked up on this when the seminar was nearly finished. Overall, this was a very straightforward seminar, with the vintners giving a brief talk about their wineries, vineyards, and Syrahs, and the seminar handout provided plenty of winemaking detail on each Syrah that was poured. Randall Graham told us that he felt Domaine Jamet Côte-Rôtie is the “fullest expression” of Syrah, and James Callahan talked about the high-altitude (4,000+ foot) elevation of his vineyards in Arizona. There was some talk about own-rooted vines, with Bill Easton telling us that all the Syrah in his Sentinel Oak Vineyard is own-rooted, and Peter Stolpman pointing out examples of own-rooted Syrah in Santa Barbara County, though this line of discussion didn’t really develop. This topic, as well as dry-farming, another topic that was touched on very briefly, would be interesting to pursue at a future seminar. I enjoyed the seminar and the diversity of the Syrahs that were presented, though there did not seem to be any real defining thread tying things together. The wines showcased Syrah’s diverse character but I found few if any of the wines were truly “pushing the limits.” Sara Schneider did a fine job of keeping the discussions on track and keeping the seminar on schedule, but with the limited time available, there was little opportunity for any of the discussions to get into much depth. As I often feel with the Rhone Rangers seminars, having fewer panelists would have been beneficial. This was still an interesting seminar, and it’s always good to taste wines and listen to the vintners in this type of setting. As always, many well-known American producers of Rhône varieties poured their wines at the event’s Grand Tasting. There were just over 65 wineries pouring this year, a good representation of the group’s members though down in number from past years due to the smaller venue. This smaller participation meant that a number of past “regulars” – and some of my favorites – did not pour at this Rhone Rangers tasting, including Clos Saron, Folin, Kale, Lagier Meredith, and MacLaren among others. In contrast to the past couple of years at Richmond’s Craneway Pavilion, where there was plenty of space but attendance lagged, this year’s event was packed. It was tough to tell what the overall number of attendees was in comparison to the past few years due to the smaller space, though. The Golden Gate Club is a fine venue, with wonderful views of San Francisco Bay, but the winery tables were squeezed pretty tightly to fit in all the participants for the Rhone Rangers tasting. I’ve been to other tastings at this site, and there were more tables packed into the space for this event than I’ve seen before. It was sometimes difficult to move between the rows of tables, and the crowds in front of some tables made it difficult to get to them – I ended up not tasting with a couple of producers I’d wanted to check out because of that. One issue that’s always been a little problematic with the Golden Gate Club venue is that there are usually more producers than can fit in the large main space, so one or more of the smaller side rooms are also needed to accommodate them. That was the case again at the Rhone Rangers tasting, though with winery tables set up alphabetically, it wasn’t too difficult to find most producers. The exception to that, which I found confusing, was that producers whose vintners had won Rhone Rangers Lifetime Achievement Awards – including Bonny Doon, Qupé, Tablas Creek, and Terre Rouge – were all grouped together in one of the smaller rooms, making them tougher to find. But these issues are basically nit-picks – overall, the organizers and their staff and volunteers did a fine job to make the event run smoothly. In all, I tasted over 90 wines from 29 producers. As is always the case with larger tastings, I ran out of time before I was able to get to all the winery tables I’d hoped to, but I managed to taste at most that I’d wanted to visit. I’d hoped to try out a few more producers that were new to me at this event, but in the end I focused more on those I’d enjoyed in the past. There were a few wineries I decided to skip since I’d tasted many of their wines (which are very good!) recently – Acquiesce, Adelaida, and Withers. And there were other producers whose wines I’d tasted recently so I tried to limit myself to bottlings I hadn’t tried at earlier tastings – Qupé, Skylark, Tercero, Terre Rouge, Two Shepherds, and Westwood. And although there was food available at the tasting, I tried to focus on the wine…although I couldn’t resist the delicious cassoulet from the girl and the fig! Maybe it was the seminar that got me in the mood for Syrah this year, but it’s clear that my list of Favorites is heavy on Syrahs – something that hasn’t been the case in the past. It’s a variety that by most accounts is still a tough sell in the marketplace but that can produce some exceptional wines. Favorites on the white and rosé side were much more varied. Of note is that five of the Syrahs that made my lists are from the 2011 vintage – another example that many wines from this vintage have been taking their time to show their best but are blossoming now. Overall favorite producers include a couple that have been consistent standouts in the past – Qupé and Tablas Creek – while several others including Andrew Murray, Jaffurs, Pax Mahle, Skinner, Skylark, and Terre Rouge were also among my favorites this year. Familiar names to be sure, and they continue to produce top-notch wines. The Rhone Rangers tasting is one of the annual wine events I look forward to most. While their new venue did limit the number of producers at the Grand Tasting, there were still more than enough excellent wines being showcased there. The smaller size of the tasting made it seem less overwhelming and more intimate than in the past. The Rhone Rangers San Francisco Bay Area tasting remains a great opportunity to check out the diversity and quality of domestic Rhône-style wines – as always, this is a “must” for Rhône fans. Andrew Murray made a splash with his first release, a 1994 Syrah from his family’s estate vineyard off of Foxen Canyon Road in Santa Barbara County. The old estate vineyard was sold in 2006 (it’s now Demetria Estate), and the winery now farms other estate vineyard sites, including the former Curtis property. Andrew Murray has focused on Rhône varieties from the start. I tasted five wines at their table – 2015 Estate Viognier, 2015 “Espérance” Estate Rosé, 2014 Estate Cinsault, 2014 “Espérance” (60% Grenache, 25% Mourvèdre, 15% Syrah), and 2014 Watch Hill Vineyard Syrah (94% Syrah, 6% co-fermented Viognier). I thought the white and rosé wines were the highlights. The Viognier, from cool Santa Maria Valley, was a particular standout – stone fruit and floral aromas with vibrant acidity and a fresh finish. The “Espérance” Rosé was nearly as good – mostly from Cinsault, this showed strawberry, earth, and herb notes with hints of flowers, with a lively mouthfeel and finish. The Cinsault, like the Rosé from the Curtis estate vineyard, was plummy, spicy, and earthy, while the “Espérance” red blend also showed an earthy character along with ripe black cherry and plum fruit. The Watch Hill Syrah, from the Los Alamos area, had dark berry fruit, smoke, and coffee aromas, medium weight on the palate, and fairly big, grippy tannins. A good line-up of wines, particularly the white and rosé. Steve and Steffanie Anglim launched their winery in 2002. Their tasting room is located in the restored train station building just a couple of blocks from the downtown city park in Paso Robles. Specializing in Rhône-variety wines, they also produce wine from a few other varieties. Steve Anglim was on hand to pour his wines, and I tasted five of them – 2013 Hastings Ranch Roussanne, 2013 Grenache, 2013 Hastings Ranch Mourvèdre, 2013 St. Peter of Alcantara Vineyard Syrah, and 2013 “Guy James” Syrah. The fruit for the wines I tried all came from the Adelaida and Willow Creek Districts on the Westside of Paso Robles. The Roussanne showed pear, spice, earth, and lees aromas, with medium body and a fairly smooth texture. The Grenache and Mourvèdre were both pleasant though straightforward renditions – bright strawberry and spice for the Grenache and ripe plum, earth, and a touch of smoke for the Mourvèdre. I thought the two Syrahs were more interesting. The “Guy James” was made with 100% whole-cluster fermentation and showed a stemmy/herbal character along with spice and dark fruit, with lots of structure and big, grippy tannins. I preferred the St. Peter of Alcantara Syrah, with entirely destemmed fruit. This showed savory, meaty aromas along with blackberry, herbs, earth, and pepper, with a lively texture and more refined tannins – approachable now but has the potential to age nicely. One of California’s early “Rhone Rangers,” Randall Grahm of Bonny Doon Vineyard originally was aiming to make great Pinot Noir but ultimately moved toward varieties from the Rhône Valley and elsewhere. “Le Cigare Volant” has become known as Bonny Doon’s flagship wine – its first vintage was in 1984. I ran out of time before I could get to the Bonny Doon table, so I only tasted their wine at the Syrah seminar – 2013 “Le Pousseur” Syrah, from the Central Coast. Showing lots of herbs and black olives on the nose along with touches of earth and leather, this was an intriguing and pleasant medium-weight bottling. Brecon was launched with the 2012 vintage by two couples, Damian and Amanda Grindley and Simon and Anna Hackett. They purchased an older vineyard on the Westside of Paso Robles and remodeled the winery and tasting room – it’s an award-winning architectural design. Damian is the winemaker, and Brecon focuses on Rhône and Bordeaux varieties as well as Albariño. I tasted three wines at the Brecon table – 2015 “Conviction” (67% Grenache Blanc, 33% Viognier), 2014 Mourvèdre (about 75% Mourvèdre and 12.5% each Grenache and Syrah), and 2014 Syrah (94% Syrah, 6% Petite Sirah). The fruit for all three wines comes from various sources in the Adelaida District of Westside Paso Robles. The “Conviction” was a highlight, featuring green apple and citrus aromas, a floral note, and a hint of fresh herbs, with vibrant acidity and a fresh finish. The Mourvèdre was also quite nice, with plummy and earthy notes upfront plus smoky and gamey undertones, medium weight with moderate tannins. The Syrah showed a darker and riper profile, with prominent vanilla/oak and spice notes, a richer texture, and firmer tannic finish. I’ve tasted a larger sampling of Brecon wines in the past, and they look like a newer winery to watch. Located in Paso Robles’ Willow Creek region, Caliza is Spanish for limestone – a key soil component in Caliza's 20-acre estate vineyard. Winemaker Carl Bowker and his wife Pam established Caliza in 2005, and they focus on wines from Rhône grape varieties. Carl was behind the winery table at the event, and I tasted four Caliza wines – 2013 Estate Syrah (tasted at the Syrah seminar), 2014 “Kissin’ Cousins” (40% Viognier, 32% Roussanne, 28% Grenache Blanc), 2012 “Azimuth” (36% Mourvèdre, 34% Grenache, 30% Syrah), and 2012 “Cohort” (58% Syrah, 30% Petite Sirah, 12% Mourvèdre). The Syrah displayed ripe dark fruit, spice, and mocha aromas, with moderate tannin and a lingering finish. The “Kissin’ Cousins” blend had apple and pear fruit, spice, and vanilla/oak on the nose, with a fairly rich texture and finish. The “Azimuth” was my favorite of the reds – this featured earthy plum and black cherry fruit plus undertones of flowers, herbs, and sweet oak, with a lively mouthfeel and fine tannins. The “Cohort” showed a riper and more fruit-forward character, with mocha, spice, and vanilla/oak notes, bigger structure and a grippier tannic finish. The Caliza wines are in the bigger “Paso style” that will appeal to fans of the style. Owners Gary Breen and Anna Beuselinck established this new venture (first vintage in 2012) in Hopland, at the site that had been the Fetzer Wine Hospitality Center. They run a family-owned farm and vineyard, and their winemaker is Sebastian Donoso, a native of Chile. Sebastian was on hand to pour the wines, and I tasted four of them – 2015 Trails End Vineyard Rosé di Grenache, 2014 “Campo de Blanca Riserva” (43% Roussanne, 33% Marsanne, 24% Viognier), 2013 Dark Horse Ranch Grenache, and 2013 Fairbairn Ranch Syrah. All of the wines come from Mendocino County fruit. The Trails End Rosé, from a vineyard in Potter Valley, was made from fruit that was crushed and left for 12 hours on the skins. This was a highlight, with strawberry, melon, and herb aromas, bright acidity, and a crisp finish. The “Campo de Blanca Riserva” showed leesy, earthy pear and stone fruit scents with a moderately rich texture and smooth finish. The two reds both displayed fairly ripe fruit, lots of spice, and somewhat grippy tannins. Located in Russian River Valley, Crux is a newer Rhône-focused label started by Brian Callahan and Steven Gower. One Crux wine was poured at the Syrah seminar – 2012 Syrah (84% Syrah, 11% Petite Sirah, 5% Mourvèdre), from Russian River Valley. Unfortunately, this wine – at least the bottle poured for a fair number of us at the seminar – was marked by a very bretty band-aid character, so much so that it obscured everything else. I’d hoped to check out some of the other Crux wines at the afternoon tasting but ran short of time. Holly’s Hill gets much of its fruit from its two estate vineyards, first planted in 1998 at an elevation of about 2,600 feet. Tom & Holly Cooper own the winery and their daughter Carrie is the winemaker, while Carrie’s husband Josh Bendick shares in the winemaking duties as well as sales and marketing. I tasted three wines at the Holly’s Hill table – 2015 Viognier, 2015 Estate Roussanne, and 2013 Estate Cinsaut. The Viognier showed a floral note along with peach and apricot aromas, a medium body, and a smooth finish. The Roussanne showed more subdued pear fruit, plus earth and orangepeel notes, a creamier texture and hints of wet stone on the finish. The Cinsaut was my favorite of the three wines, with earthy black cherry fruit, herbs, and black pepper, a lighter-bodied red with mild tannins – a good choice to pair with lighter foods over the near term. Craig Jaffurs launched his label with the 1994 vintage after spending five years at Santa Barbara Winery. He’s focused almost exclusively on Rhône-style wines over the years, with fruit sourced from Santa Barbara County vineyards. Craig and winery general manager Dave Yates poured their wines at the event, and I tasted six of them – 2012 Bien Nacido Vineyard Syrah (tasted at the Syrah seminar), 2015 Thompson Vineyard Grenache Blanc, 2015 Bien Nacido Vineyard Viognier, 2013 “High Tide” (50% Mourvèdre, 33% Grenache, 17% Syrah), 2013 Larner Vineyard Syrah, and 2013 Thompson Vineyard Syrah. The Bien Nacido Syrah featured ripe dark fruit, coffee, and hints of flowers and black olives – the big structure and grippy tannins show that cellaring is needed but this had good potential. I enjoyed both whites at the Jaffurs table. The floral, spice, and apricot aromas of the Viognier led to a moderately-rich mouthfeel, though I preferred the bright apple, herb, and floral notes of the lively Grenache Blanc – made in 50% each stainless steel and neutral oak – which featured a chalky mineral finish. The “High Tide” had higher-toned red fruit and spice, while the Larner Syrah – fermented with about 33% whole clusters and co-fermented with a little Viognier – showed blackberry, earth, and coffee aromas and bigger structure. I preferred the Thompson Syrah for its savory and stony mineral character, though its big, grippy tannins revealed that it will need plenty of time in the cellar. Solid wines as always from Jaffurs. Ken Volk established his own label in 2004 after founding Wild Horse Winery in Templeton in the early 1980s and running it until 2003. The first releases from his own label came in 2006. He’s been a champion of lesser-known grape varieties of California, making wines from Blaufränkisch, Tannat, Touriga, Verdehlo, Malvasia Bianca, Aglianico, Negrette, Cabernet Pfeffer, and Orange Muscat among others. I tasted three wines at the Kenneth Volk table – 2014 Garnacha Blanca, 2012 Rio San Benito Vineyard Grenache, and 2012 Enz Vineyard Mourvèdre. All were sourced from vineyards in San Benito County. The Garnacha Blanca (the Spanish version of the Grenache Blanc varietal name) featured tropical fruit and herb aromas while the Grenache showed fairly straightforward red fruit and spice notes. The Mourvèdre was the most interesting of the three wines – with fruit from old head-trained vines, this had ripe plum and blueberry fruit, loads of spice, medium acidity, and firm, chalky tannins. Leverage is a brand-new label, sourcing fruit from the Westside of Paso Robles and making the wine in Paso’s Tin City complex. Aaron Jackson (of Aaron / Aequorea Wines) is the consulting winemaker. Jason DiFrancesco and his crew poured Leverage’s three inaugural release wines – 2015 Rosé (from Grenache, Mourvèdre, Syrah, Petite Sirah), 2014 “Acceleration” (70% Grenache, 30% Syrah), and 2014 “Trajectory” (41% Grenache, 32% Syrah, 27% Mourvèdre). The Rosé had bright strawberry and cherry fruit with a lively mouthfeel and mildly chalky texture on the finish. The two reds were made with 15-20% whole-cluster fermentation and aged in one-year old French oak. The “Acceleration” showed ripe red fruit plus earth and lots of spice, with tingly acidity and moderate tannins. My favorite of the three wines was the “Trajectory,” displaying earth, herbs, plum and darker berry fruit, and a stony mineral component, with good structure and firm tannins on the finish – has the potential to age nicely. Miraflores is owned by Victor and Cheryl Alvarez. Their estate vineyard in El Dorado County, at an elevation of about 2,500 to 3,000 feet, includes Rhône and Bordeaux varieties, along with Zinfandel, Tempranillo, and a few others. Winemaker Marco Capelli has been part of the Miraflores team since their inaugural vintage in 2003. I tasted three wines at the Miraflores table – 2013 “Clone” (about 25% each Grenache, Mourvèdre, Syrah, Petite Sirah), 2012 Estate Mourvèdre, and 2014 Estate Viognier. The “Clone” bottling featured ripe plum fruit and lots of spice, with a lively texture and medium tannins. The Mourvèdre showed plum, smoke, and earth aromas and finished with bigger but refined tannins, though the acidity seemed a bit lacking. I finished with the Viognier, which was very floral, plus pear and stone fruit notes, with a fairly smooth mouthfeel and finish. ONX (pronounced “onyx”) was founded by Steve Olson, who purchased property in 2005 in the Templeton Gap area on the Westside of Paso Robles. The estate vineyard is now planted with over a dozen grape varieties. Winemaker Brian Brown and associate winemaker Jeff Strekas head up the production, and many of the wines are rather non-traditional blends. I tasted three wines at the ONX table – 2013 “Mad Crush” (43% Grenache, 39% Tempranillo, 9% Syrah, 9% Mourvèdre), 2013 “Crux” (33% Grenache, 33% Syrah, 30% Mourvèdre, 4% Alicante Bouschet), and 2013 “Reckoning” (62% Syrah, 19% Petite Sirah, 13% Cabernet Sauvignon, 6% Malbec). The “Mad Crush” turned out to be my favorite of the three, with bright red fruit, smoke, spice, and earth, a lively texture and firm tannins. The “Crux” blend was riper and darker in character, with spice and vanilla/oak notes, and featuring vibrant acidity along with a richer texture and grippier tannins. “Reckoning” also showed ripe dark berry fruit, with notes of herbs and pepper plus sweet oak on the nose, fairly rich mouthfeel and a chewy tannic finish. Definitely in the “Paso style” of big Rhône wines. 2010 marked the first vintage of Pax and Pam Mahle’s re-launched Pax label, joining their Wind Gap and Agharta projects. Pax had started his first label in 2000 after working as a wine buyer for Dean & DeLuca. The new Pax releases have been mostly Syrah and Grenache sourced from Alder Springs, Castelli-Knight Ranch, and Griffin’s Lair vineyards in Sonoma and Mendocino County. I tasted five Pax wines – 2013 Castelli-Knight Ranch Grenache, 2013 “The Hermit” Syrah, 2014 “The Vicar” Grenache, 2015 Testa Vineyard Carignan, and 2012 Castelli-Knight Ranch Syrah. The bright, spicy, and red-fruited Castelli-Knight Grenache contrasted with the earthy, leathery, and tannic “The Vicar,” and the Carignan displayed the darker, earthier side of that variety. “The Hermit” is a blend from all the Pax North Coast Syrah vineyards, and it was one of my favorites at the table, with savory, earthy, and peppery blackberry and herb aromas, great structure, and moderate tannins. Even better was the Castelli-Knight Syrah, featuring aromas of herbs, black olives, dark berry fruit, and a stony mineral note – the big, grippy tannins showed that this still need time but it’s loaded with promise, one of the tasting’s standout Syrahs. Overall a fine group of wines from Pax. Bob Lindquist was one of the earliest of California’s “Rhone Rangers,” establishing his winery in 1982. 40-acre Sawyer Lindquist Vineyard, in cool Edna Valley, has been biodynamically-farmed since the first plantings in 2005. Bob’s son Ethan has his own eponymous label, and he’s also a partner and winemaker for the No Limit label. 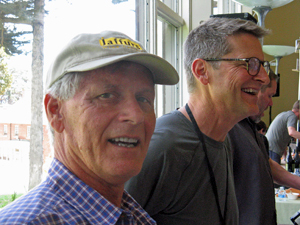 Both Bob and Ethan were on hand to pour their wines at the event. I tasted seven of their wines – Qupé 2012 “Sonnie’s” Sawyer Lindquist Vineyard Syrah (tasted at the Syrah seminar), Verdad 2015 Rosé (55% Grenache, 45% Mourvèdre), Qupé 2013 Marsanne (75% Marsanne, 25% Roussanne), Qupé 2012 Bien Nacido Hillside Estate Roussanne, Qupé 2011 Bien Nacido Hillside Estate Syrah, No Limit 2011 “All In” Sawyer Lindquist Vineyard Syrah, and No Limit 2011 “The Nuts” Sawyer Lindquist Vineyard Syrah. The “Sonnie’s” Syrah has been a consistent favorite over the years, and the latest release was no exception. Very savory, meaty aromas along with blackberry, flowers, leather, and spice, this had a bright mouthfeel with fine tannins and a stony mineral note on the finish. Tasting later in the day at the table, I started with the Verdad Rosé, from the label of Bob’s wife Louisa. This featured fresh red fruits, herbs, and a slight floral note, with bright acidity and a crisp finish. The Marsanne was perhaps the best young Qupé Marsanne I’ve tried, with stone fruit and honey on the nose, and balancing moderate richness with fine acidity and a long finish. The Roussanne showed aromas of pear, earth, and a touch of honey, with a richer mouthfeel and smooth finish. The Qupé Bien Nacido Hillside Estate Syrah had herbs, pepper, and a stony mineral note along with dark berry fruit with big but refined tannins. The bolder No Limit bottlings were more about the forward fruit – I preferred “The Nuts” for its ripe blackberry fruit plus earth, smoke, and coffee aromas with floral undertones, and both bottlings had a firm tannic finish. The wines from the Lindquist family have been top-notch for years and remain so, and the Qupé wines in particular – both red and white – have proven to be remarkably ageworthy. Ridge is one of California’s most renowned wineries, founded in 1959. Paul Draper joined Ridge in 1969 and he’s headed their winemaking team ever since, though he recently announced his retirement. Ridge has made wines from Dry Creek Valley since the mid-1960s, and purchased their Lytton Springs property there in 1991. 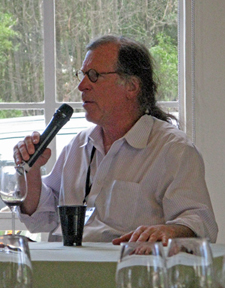 John Olney has been in charge of winemaking at Lytton Springs since 1999. 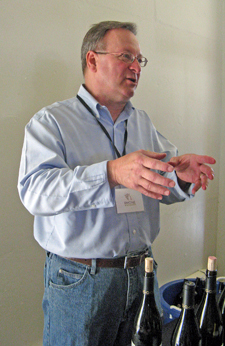 David Gates joined Ridge in 1989, and manages the estate vineyards – he was on hand to pour at the tasting. I tried five Ridge wines – 2014 Buchignani Ranch Carignane, 2012 Lytton Estate Syrah/Grenache, 2011 Lytton Estate Syrah (84% Syrah, 10% Grenache, 6% co-fermented Viognier), 2013 “Lytton Estate” (40% Grenache, 40% Mataro, 15% Zinfandel, 5% Carignane), and 2014 Petite Sirah (pre-release). The Carignane, from 75-year old head-trained vines in the hills north of Dry Creek Valley, displayed red fruit, spice, and earth, with medium weight and moderate tannins. The last four wines were all from Ridge’s Lytton Estate Vineyard. Syrah/Grenache had a darker fruit profile along with coffee and spice notes, with a brighter mouthfeel and firmer tannic finish. The Syrah was my favorite of the Ridge wines, with stony mineral, floral, and spicy aromas to go with the dark berry fruit and undertones of vanilla/oak, finishing with fine tannins. The “Lytton Estate” bottling was dark, earth, and a bit peppery, with a grippier tannic finish, while the Petite Sirah featured dark berry fruit along with floral and spice notes plus a dash of sweet oak, finishing with big, chewy tannins. As I’d found from a recent tasting of older Ridge Petite Sirahs, they can age for decades, so no hurry on this one! Rune winemaker James Callahan founded his winery in 2013 in Sonoita, Arizona. He’s worked at a number of wineries in regions as diverse as Napa Valley, Walla Walla, New Zealand, and Russian River Valley. Most of the Rune wines to date have been made from Rhône grape varieties. One Rune wine was poured at the Syrah seminar – 2014 “Wild” Syrah (97% Syrah, 3% Viognier). With fruit sourced from Pillsbury Vineyard in Arizona’s Cochise County, this showed ripe plum and darker fruit, spice, flowers, and a hint of wet stones on the nose, with good structure and chewy tannins on the finish. Winemaker John MacCready and his wife Barbara bought their El Dorado County property in 1972 and the first vintage of Sierra Vista wines was in 1977. John planted Syrah in their estate vineyard in 1979, one of the earlier modern plantings of that variety in California. I tasted five wines at the Sierra Vista table – 2015 Estate Viognier, 2015 Rayas Vineyard Estate Grenache, 2015 Cinsault (barrel sample), 2015 Estate “Fleur de Montagne” (Grenache, Mourvèdre, Syrah, Cinsault), and 2014 “West Slope” Estate Mourvèdre. The Viognier had intense floral and peach aromas though it could have used a bit more acidity. Of the reds, I thought the “Fleur de Montagne” showed a mildly band-aid aroma associated with brett while the “West Slope” Mourvèdre had earthy, herbal, and black cherry notes and firm tannins. I preferred the other two reds. The Grenache from the estate Rayas Vineyard (the vines are believed to have originated from Château Rayas in Châteauneuf-du-Pape) featured ripe red fruit, spice, and earth, with floral undertones, a lively texture, and moderate tannins. The Cinsault barrel sample was very promising, with bright strawberry and cherry fruit, savory herbal notes, and undertones of earth and black pepper. A bit hit-and-miss for these wines but with a couple of winners. Mike and Carey Skinner established their family winery in the Fair Play area of El Dorado County in 2007. They farm two estate vineyards – one at a lower elevation and one at a higher site next to the winery – and source much of their fruit from them. Winemaker Chris Pittenger was behind the winery table at the event, and I tasted five Skinner wines – 2013 Syrah (86% Syrah, 9% Viognier, 5% Counoise, tasted at the Syrah seminar), 2015 Grenache Blanc, 2015 Rosé (40% Mourvèdre, 35% Counoise, 25% Grenache), 2013 Grenache, and 2014 Mourvèdre. The Syrah was one of the highlights of the seminar, with complex aromas of flowers, wet stones, earth, pepper, and dark berry fruit – structured and finishing with chalky tannins, this should age nicely. The Grenache Blanc was made in both stainless steel and neutral oak, with a little seeing some skin contact prior to pressing – with apple, herb, and floral scents, this was quite pleasant. The Rosé was a standout – from fruit picked specifically for this wine, spending 2-12 hours on the skins, and made entirely in neutral oak, this had bright watermelon, earth, and floral notes with refreshing acidity and a clean finish. The ripe, spicy, and red-fruited Grenache was good, but I preferred the earthy, plummy, and smoky Mourvèdre – although it has the stuffing to cellar for awhile, it’s delicious right now. Skinner presented one of the strongest line-ups of wine I tried at the event. Skylark was founded in 2002 by John Lancaster and Robert Perkins of Boulevard Restaurant in San Francisco. Most of the vineyard sources for the Skylark wines are from Sonoma and Mendocino counties. John was pouring his wines at the event, and as I had tasted several Skylark wines recently, I Iimited myself to two I hadn’t tried before – 2012 Grenache, and 2012 Rodgers Creek Vineyard Syrah. The Grenache featured bright red fruit, lots of spice, earth, and wet stone notes on the nose, with a lively texture and finish. 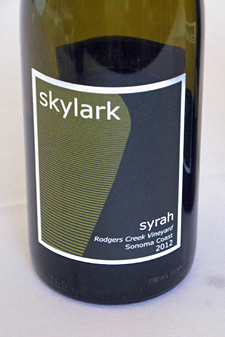 The Syrah, from a cool-climate site in the Petaluma Gap, was fermented with about 30% whole clusters and had very savory, meaty aromas along with dark berry fruit, herbs, and pepper, plus good structure and moderate tannins – tasty now, though Skylark’s Rodgers Creek Syrah bottlings have shown they can age beautifully. Another fine showing for the Skylark wines. Located in Santa Ynez Valley’s Ballard Canyon AVA, Stolpman Vineyard has been one of that area’s finest grape sources for many years. Founded by Tom and Marilyn Stolpman in 1990, it’s now run by their son Peter and daughter Jessica. Ruben Solorzano manages the vineyard while Sashi Moorman makes the wines. 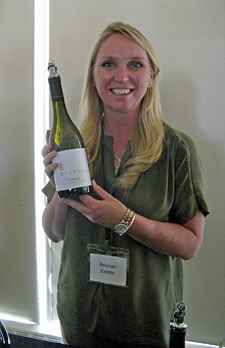 One Stolpman wine was poured at the Syrah seminar – 2013 Estate Syrah, from Ballard Canyon in Santa Ynez Valley. One of the seminar’s highlights, this featured black olive, herb, and earth aromas plus dark berry fruit and a touch of black pepper, with a lively mouthfeel and finish. This was another winery I’d hoped to check out at the Grand Tasting but ran out of time. Tablas Creek is co-owned by the Perrin family (of Château de Beaucastel fame) and Robert Haas (founder of Vineyard Brands importers). Their 120-acre estate vineyard on the Westside of Paso Robles was first planted in the early 1990s. The vineyard was certified organic in 2003 and has been farmed using more biodynamic techniques in recent years. 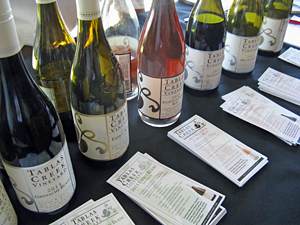 I tasted six wines at the Tablas Creek table – 2014 Grenache Blanc, 2013 “Esprit de Tablas Blanc” (71% Roussanne, 21% Grenache Blanc, 8% Picpoul Blanc), 2015 “Patelin de Tablas” Rosé (68% Grenache, 13% Counoise, 11% Mourvèdre, 8% Syrah), 2014 Counoise, 2013 Mourvèdre, and 2013 “Esprit de Tablas” (40% Mourvédre, 28% Grenache, 22% Syrah, 10% Counoise). The fruit for all of these wines is entirely from the estate vineyard except the “Patelin de Tablas” bottling. The Grenache Blanc was delicious, with bright apple fruit, fresh herbs, and a vibrant mouthfeel with a refreshing finish. The “Esprit de Tablas Blanc” was even better, displaying a stony mineral character plus scents of flowers, pear and stone fruit, earth, and herbs, with a richer texture balanced by fine acidity. The Rosé showed subtle watermelon and bright red fruit with a clean finish. Of the reds, the Counoise is young but very approachable, with raspberry fruit with touches of flowers and earth, a fairly light and lively mouthfeel with a minerally note on the finish. The Mourvèdre featured lots of earth and smoke aromas plus darker berry fruit and dried herbs, with plenty of structure and chalky tannins, while the “Esprit de Tablas” showed more plum character along with smoke, pepper, earth, notes of flowers and wet stones, with a firm tannic finish. Both the Mourvèdre and the “Esprit de Tablas” deserve more time in the cellar. Tablas always presents a strong group of wines, and this was no exception. The Tenet wines are a collaborative effort between Chateau Ste. Michelle in Washington state and the Rhône Valley’s Michel Gassier and Philippe Cambie. 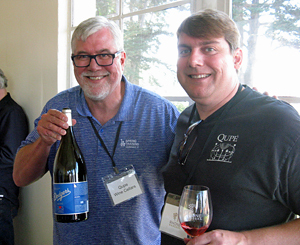 One Tenet wine was included in the Syrah seminar – 2014 “The Pundit” Syrah (88% Syrah, 6% Grenache, 4% Mourvèdre, 2% Viognier), from Columbia Valley. With upfront ripe dark berry fruit along with touches of spice and sweet oak, this was certainly more New World in character than Rhône Valley. Larry Schaffer started his Tercero label with the 2006 vintage while he was working for Fess Parker Winery – he’s focused on Tercero full-time since 2011. His specialty is wines from Rhône grape varieties sourced from Santa Barbara County vineyards, though he makes a very nice Gewürztraminer and Albariño as well. I had tasted a number of other Tercero wines recently, so I picked three that I hadn’t tried before – 2014 Camp 4 Vineyard Marsanne, 2011 Camp 4 Vineyard Grenache, and 2011 White Hawk Vineyard Syrah. The Marsanne, made in neutral oak, had aromas of pear, earth, and honey, with medium body and a smooth finish – shows potential and should develop well with bottle age. The Grenache displayed red fruit and spice on the nose, with vibrant acidity and moderate tannins. The Syrah, aged for 30 months in older oak, was my favorite of these three wines, featuring dark fruit, savory and herbal notes plus earth and pepper undertones, good structure and a firm tannic finish – another wine that should age nicely. 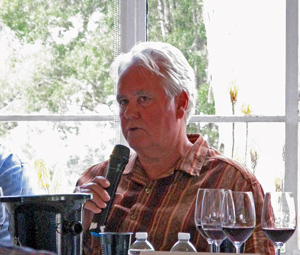 A longtime leader among Sierra Foothills Rhône-style producers, Bill Easton of Terre Rouge poured his wines at the tasting. He founded his winery in Amador County’s Shenandoah Valley in 1994 – prior to that, he owned and ran the well-known Solano Cellars wine shop in Berkeley. I had tasted several Terre Rouge wines at another recent event, so I limited myself to three on this occasion – 2011 Sentinel Oak Vineyard Syrah (tasted at the Syrah seminar), 2014 Viognier, and 2012 “L’Autre” (63% Grenache, 19% Mourvèdre, 18% Syrah). The Syrah was a standout, with plum, spice, and floral aromas, touches of herbs and pepper, and plenty of structure of extended aging. The Viognier displayed subtle pear, earth, and lees notes, with medium body and a lively mouthfeel and finish. The “L’Autre” blend was notable for the freshness of its red fruit aromas along with earth, spice, and smoke notes with a hint of wet stones, plus bright acidity and fine tannins on the finish. A very good group of wines. Tony and Jo Ann Truchard planted their estate vineyard in the Carneros region of Napa Valley in the 1970s. After selling their fruit to other vintners for a number of years, they started producing their own wine in 1989. Sal De Ianni is the Truchard winemaker, and all the wines are made from estate-grown fruit. Tony and Jo Ann poured two wines at the tasting – 2014 Roussanne and 2014 Syrah. The Roussanne was a highlight – barrel-fermented in mostly neutral oak, and featured pear and stone fruit aromas plus undertones of spice and earth, medium-bodied with bright acidity and a long, clean finish. The Syrah was quite nice as well, with savory and peppery dark fruit, herbs, and a touch of vanilla/oak, with a lively mouthfeel and fine tannins. 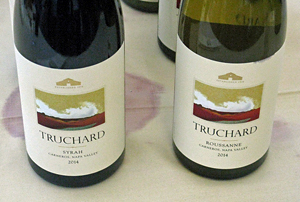 Truchard tends to be overlooked for its Rhône-variety wines but both of these were very good. Two Shepherds focuses mainly on wines made from Rhône grape varieties. The wines are made in Sonoma County, and the first commercial vintage was in 2010. 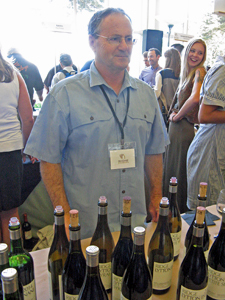 Owner/winemaker William Allen was behind his winery table at the event. I had tasted a number of other Two Shepherds wines in recent months, but I found two that I hadn’t had before – 2014 Catie’s Corner Vineyard Viognier and 2015 Trimble Vineyard Carignane Rosé. The Viognier had bright citrus, herb, and spice aromas with just a touch of the variety’s characteristic floral scent, along with fine acidity and a crisp finish. The Carignane Rosé, from 40-year old head-trained and dry-farmed vines in Mendocino County, was made in 50% each stainless steel and neutral oak. This had very savory red fruit aromas, with undertones of spice and wet stone, vibrant acidity and a fresh finish – one of the standout rosé wines of the tasting. Westwood’s estate Annadel Gap Vineyard, in northern Sonoma Valley, was planted in 2001 to Viognier, Roussanne, Pinot Noir, Grenache, Mourvèdre, Syrah, and Counoise. 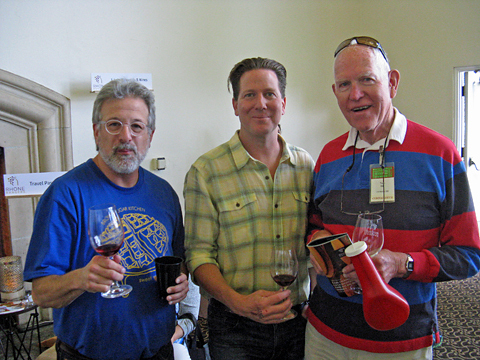 Ben Cane, formerly with Twomey Cellars, is the winemaker and David Ramey consults. 2014 marked the inaugural releases from the new Westwood label. I had tasted a number of other Westwood wines at another recent event, and just tried the one Westwood wine at the Syrah seminar – 2014 Estate Syrah. This had subtle earthy and stony mineral notes along with dark fruit and a somewhat woody oak component, plus good structure and a grippy tannic finish. Wrath is located in Monterey County, and was known as San Saba until 2007, when the current ownership team took over. Much of their fruit comes from the Santa Lucia Highlands AVA, while their own San Saba Vineyard is just outside the AVA boundary. Sabrine Rodems is the winemaker. One Wrath wine was poured at the Syrah seminar – 2013 San Saba Vineyard Syrah, from Monterey County. One of the standout wines of he seminar, this had black olive and herb aromas along with black fruit, coffee, spice, and sweet oak. I’m not sure this wine has the stuffing for extended aging but it’s delicious right now.